Mexico recently held its 2012 Presidential elections, and its telegenic PRI candidate, Enrique Peña Nieto, won by six points. This win is problematic. First of all, the PRI, which stands for Partido Revolucionario Instituto, or the Institutional Revolutionary Party, has a long and storied history of corruption and massive electoral fraud. They held power by fair means and foul for decades before finally losing to the more moderate right-wing group PAN, the Partido Acción Nacional, or National Action Party, six years ago. The 2006 election had its own issues; PAN beat out the center-left-wing candidate by a sliver of a percentage point under murky circumstances, and the candidate, former Mexico City mayor Andrés Manuel López Obrador, was characterized as a whiner and a sore loser after several fruitless demands for a full recount. However, PAN's Calderon has angered so many Mexicans now so much with his tactics against drug cartels, which have ratcheted up violence to record levels, that PAN didn't stand a chance in this election. In light of this history, things were looking very good either for the PRI, which for all its nepotism and corruption at least brought stability and prosperity for some, or for something different: Obrador. Obrador's party is called MORENA, which stands for Movimiento Regeneracion Nacional, or National Regeneration Movement. His platform is solidly socially democratic, supporting women's rights, help for the poor, indigenous rights, the well-being of mentally and physically challenged people, and free or cheap education. He is also an ex-PRI member who split with the party years before over ideological differences. The first rumblings of trouble came several weeks ago, when students and activists complained that the Mexican television networks favored the PRI candidate. Students formed the #YoSoy132 movement, engineered and driven by Facebook and Twitter, demanding more transparency in politics and media. There are other movements as well: Indignados, Occupiers, and people who claim no ideological platform but are simply fed up. The Yo Soy 132 movement and AMLO supporters have compiled hundreds of examples of vote-buying and are making a further case for fraud. Furthermore, while there are still many supporters of neoliberalism, many more in Mexico are weary and wary of neoliberalist policies and their effects. PRI, with its embrace of neoliberalism, is no longer the direction they want to go. However, people all over the place said that while they didn't like the PRI's ascendancy, they would accept it so long as they felt that their votes had counted. As it stands right now, many do not. 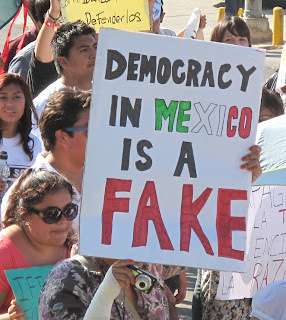 So PRI, the party that ruled Mexico via force and well-documented fraud for eighty years, left it socially stratified to the point that Mexico, one of the most resource-rich countries in the world, now has an enormous underclass, which is borne out in massive amounts of poverty, illiteracy, and racism; that affects the United States in obvious ways, as many people flee north for the promise of a better life and more money. But the PRI's candidate beat Obrador by six points. 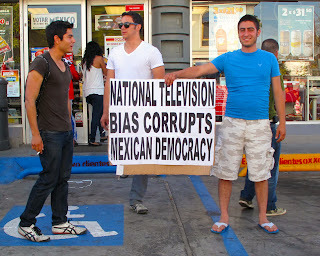 Mexicans, particularly young and fiery ones, have already been in the streets in the hundreds of thousands demanding more transparency in government and media, as major television networks has been transparently and -- by admission! -- slanted in favor of PRI. They demanded a recount of all the votes. Nope, said the government, PRI is the winner, and anyway a full recount will take until September. Yesterday, marchers took to the streets to express their dissatisfaction and frustration. The marches were peaceful, well-organized, and unprecedentedly large; they trended in Twitter under the hashtag #MegaMarcha. 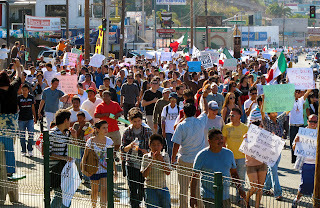 In Tijuana, estimates of the crowd size ranged from 6,000 to 20,000, and ten times that turned out in Mexico City. People turned out by the hundreds of thousands in every major Mexican city, and there were other demonstrations outside Mexico to show support: New York, Los Angeles, Vancouver, and Montreal were but a few. 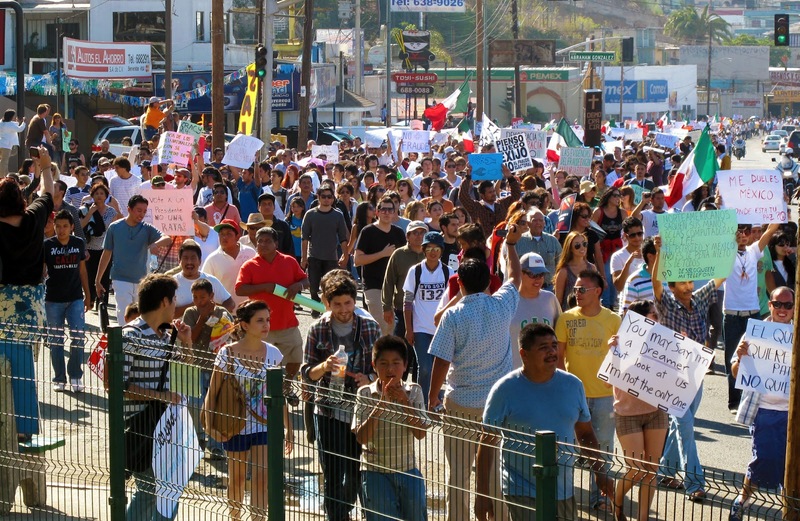 I was in Tijuana, where by my estimation at least 20,000 participated, young and old, bright-faced upper-middle class kids yelling, "Fuera Peña!" (Out, Peña!) and toothless old men smiling and nodding to passersby and politely saying, "Democracia. Democracia, por favor. No tenemos democracia, y la necesitamos." (Democracy, democracy please. We don't have it and we need it.) The police had guns at their belt and held white carnations in their hands, given to them by the protestors. Nobody knows what will happen next. Many of the people I spoke to confided that they are terrified of what PRI will do; if they do take power, they said, the next demonstration will involve bullets, not flowers. 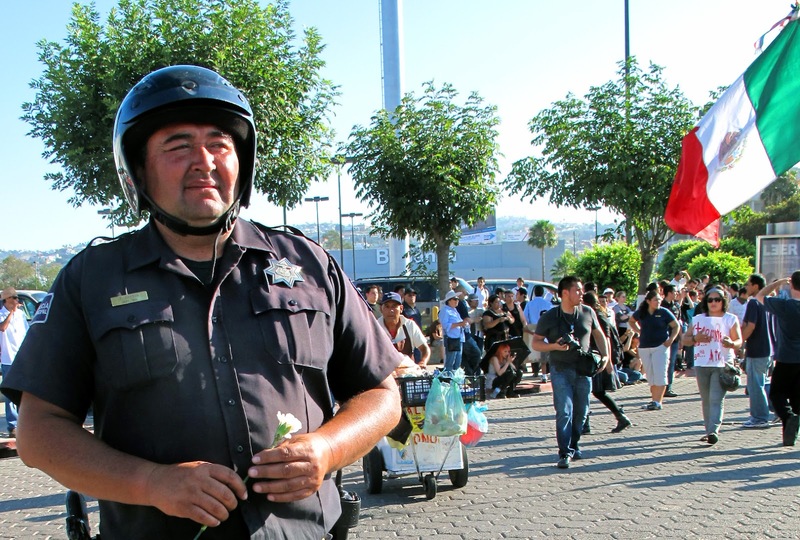 They are most afraid of the political tide turning Mexico into a police state. But if the sheer numbers and engagement of Mexicans, especially young ones, is anything to go by, there is hope that no matter what happens in the short-term, the country will end up with the democracy and transparency it demands. 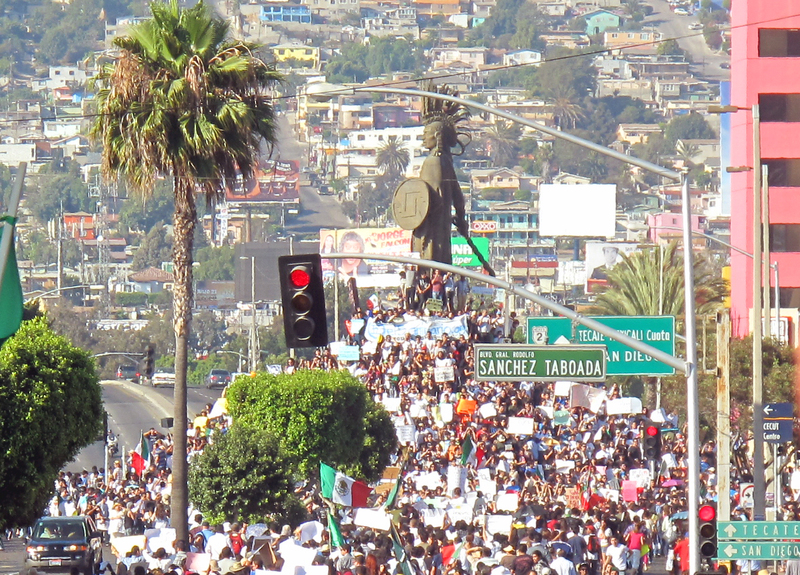 Many people yesterday carried signs that read "México ha despertado" -- Mexico has risen.